The team carried out dust free diamond grinding floor preparation using a Blastrac BG250E, a heavy duty, electric single-disc grinding machine with a 250mm diameter powerful buffing system. It is ideal for use with industrial flooring applications, concrete preparation, decontamination jobs and comes with low vibration levels making it user friendly and environmentally friendly. The team began the resin application with one coat of Flowcrete’s Hydraseal Damp Proof Membrane primer, allowing for the immediate installation of the resin screed floor finish resulting in faster installation times. The first coat is applied in red to allow for visual control and to ensure complete and even coverage. Hydraseal is a popular primer coat and has been used for projects such as PC World, Boots, Marks & Spencer and Pets at Home. The team used Flowcrete’s Peran TCW primer for vertical surfaces for the 50 liner metres coving. 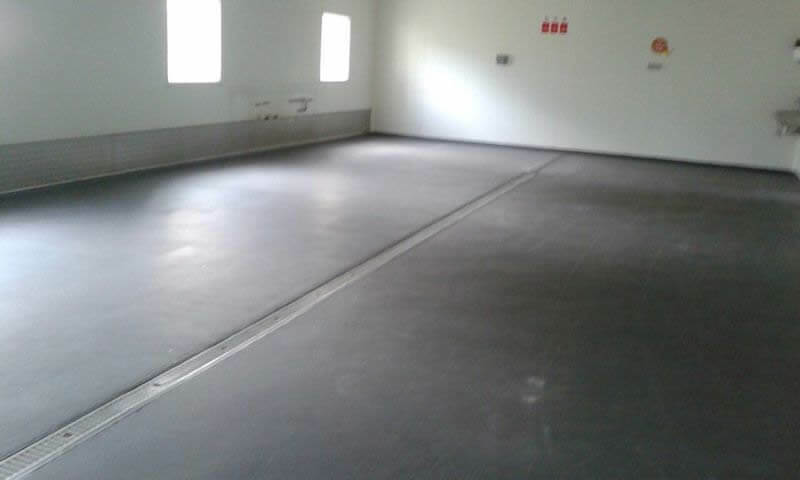 The team returned the next day to apply Flowcrete’s Flowfresh HF at 6mm thickness in dark grey. The unique benefit of Flowfresh HF is the antimicrobial additive – PolygieneR, which will not only prevent bacteria from growing, but will also kill bacteria when it comes into contact with the floor. It is steam cleanable and is heat resistant to 120 degrees centigrade. Combine all this with a 10 year manufacturer and workmanship backed warranty, is what makes Flowstone a good choice for clients in the food industry. Flowfresh HF is guaranteed for 10 years and has a life expectancy of between fifteen to twenty years. It has recently been installed at food production facilities for Nestle, McVities and Grants Whiskey. Flowstone finished the project by applying Flowfresh Coving to 50 linear metres in dark grey at 100mm high by 50mm radius and 9mm depth to complete a seamless, hygienic, floor to wall box finish. Two seal coats of Flowfresh Cove Coating in dark grey were used to ensure a good colour match between the floor and the cove. The job was completed on budget and on time, which was of particular importance to the client, with the imminent start of the new academic year.